As you may remember, our beloved Darla had five mast cell tumor surgeries over the past few years to remove these cancerous growths. 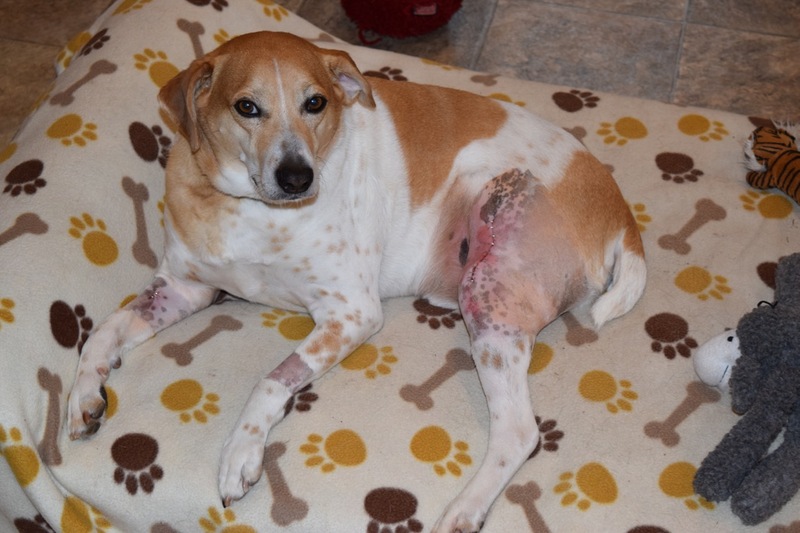 We had scheduled her sixth mast cell surgery when we found out she had a blood disorder that ultimately cost Darla her life. So you can imagine our dismay when a few weeks ago, I felt a small growth on Tanner’s knee. Something just told me (too much experience, perhaps?) that it could be a mast cell tumor. I know we are hyper-sensitive after Darla’s experience, but we realized we needed to get it tested. I took Tanner to our local clinic, where our primary care vet, Dr. Nancy Lefavour, did a fine-needle aspirate, put the cells on a slide, looked through the microscope, and pronounced the verdict: Yes, she said, it was indeed a mast cell tumor. She said, “You’re really good at finding these.” I groaned. Later that day I called our veterinary specialty hospital in Burlington, Peak Veterinary Referral Center, to schedule surgery to remove the growth. A week later, I took Tanner over to see our surgeon, Dr. Kurt Schulz, and the oncologist, Dr. Noelle Bergman. Kurt took Tanner into surgery early that afternoon. I took the photo above of Tanner a couple of days after the operation. He came through it just fine. His only problem was that for the first day following the surgery, he was reluctant to walk, because of course the surgery was on his only knee, which made walking uncomfortable. No other rear leg to shift the weight to! We used slings to help him get around until he was ready to fully use the leg. Kurt called last week with the pathology results, and it was good news all around: Clean margins on the incision site, and a low grade 2 tumor. What now? Well, just like with Darla, we will have to constantly monitor Tanner for new growths. As Noelle said when she saw Tanner, “There’s a saying: Once a mast cell dog, always a mast cell dog.” We just don’t know whether Tanner will be the once every few years type, or — as with Darla — once every several months. We know which we’re hoping for! Technical note: We are going to migrate the website to new servers later this week, so if the website is unavailable or things look a bit weird, that’s probably why. Hopefully no one will notice anything, but just a heads up that there may be some brief downtime. Oh, precious Tanner……..praying no more unhealthy cells in your little body! You guys don’t need any more hard news either………love to you all. Awwww, Tanner!!! Get well soon!!! The blessing is y’all are good at noticing these tumors to get immediate care.. great result. I’m hoping also for very few over the years too. Oh Tanner, bless your heart! Glad you are doing better! Oh no, poor Tanner! Let’s hope he only does this once every few years instead of every few months. He looks a bit sorry for himself, but very comfy on his bed. Beloved Tanner feel better soon?? Poor Tanner; he looks so sad. Of course it had to be his one back leg, poor guy. Let’s hope this is the only tumor and he gets back to playing really soon. Hang in there, Steve and Alayne. Sometimes life just feels like a test. But it always gets better. I’m a big fan of Tanner’s and am happy that you caught his cancer early. I too am hoping that the mast cells are few and far between. Tanner’s in great hands and care no matter what. Poor Tanner! Hope you get better soon.